Henderson Building Group installed a custom built Redwood wine cellar with WhisperKool refrigeration in Charlotte holding more than 250 bottles of wine. This custom wine cellar or other upgraded amenities are available in your home by contacting Henderson Building Group at 704-201-1429 or send us an email. Henderson Building Group customized this Lake Norman 2-story concrete terrace featuring a spiral staircase and retractable outdoor LG television in Denver. Perfect for Panthers Gameday! Contact Henderson Building Group for a great outdoor entertainment area at 704-201-1429 or send us an email. Customized kitchen in Charlotte with Ultracraft cabinets, granite countertops, Wolf and subzero appliances. Gorgeous accents! Interested in upgrading your kitchen? Contact Henderson Building Group at 704-201-1429 or send us an email. 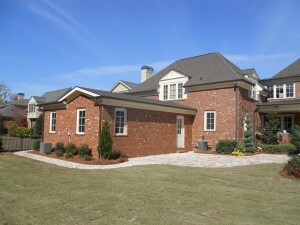 Custom brick home in Charlotte, NC exclusive gated community features 4 bedrooms, 3 bathroom and customized study. Interested in building a Custom Home? Contact Henderson Building Group at 704-201-1429 or send us an email. For more information go to the Custom Homes page or Home Page. Created an Outdoor Living space in Cornelius NC with a new cedar deck and custom powder coated aluminum railing adding just the right touch for outdoor entertaining. Interested in a custom deck or expanding your outdoor living area? Contact Henderson Building Group at 704-201-1429 or send us an email. For more information go to the Outdoor Living page or Home Page. This spiral wrought iron staircase leads to the second story of this Charlotte, NC home. I interviewed 8 contractors for this project and ended up hiring Henderson Building Group. This was a great decision – the project could not have gone smoother and I attribute that to Brooks Henderson. When he first came to look at the house he was far more detailed and thorough in his assessment than most of the others. He spent plenty of time considering the situation, asked excellent questions, and requested to come back several times with experts before providing his estimate and recommendations. Brooks provided a very thorough proposal document with detailed sections for each component of the job, costs associated with each, a very realistic timeframe, and a payment schedule based on various completion points. Unlike many contractors, Brooks is completely honest, never tries to hide anything, and does everything by the book. He handled the permit process and work began on the date we had agreed on…and he finished right on schedule. Brooks was always present to make sure work was on schedule and being done properly. He was the first person here in the morning and the last person to leave and lock up in the evening. He truly understands how a large project can disrupt your life, and made every effort to minimize that – blocked off work site from rest of house, cleaned up every day, doors were locked when I was gone, and always asked for permission before scheduling work in evenings or on weekends. He was also very friendly and respectful of my family, which goes a long way for me. I could go on all day about how smooth this project was and how pleased I am with the final result. I will hire Brooks again and do not hesitate to recommend his services to anyone looking for a good contractor. Brooks is an honest man who will treat you and your project with respect. He is a true professional in every aspect and delivers a phenomenal end product. Thanks Brooks!